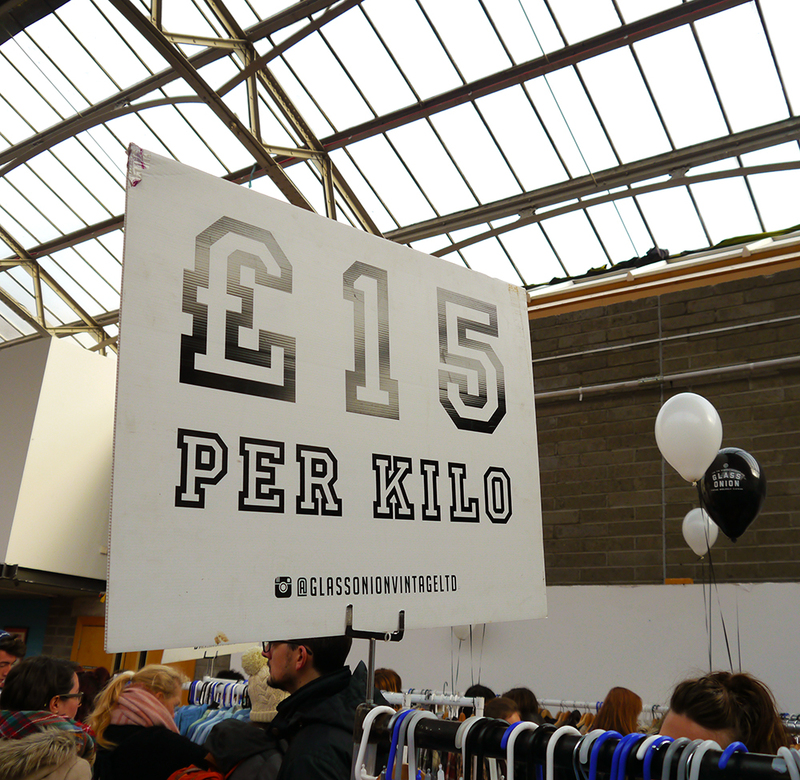 The lovely folk over at The Vintage Kilo Sale invited us to come along to their Edinburgh event last weekend. 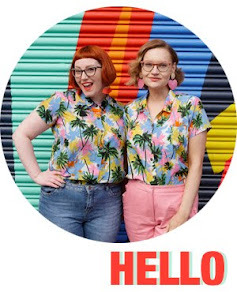 Buying clothes by the kilo is an interesting idea and can mean a whole new wardrobe for a fraction of the usual vintage prices. Brought to us by the people behind Judy's Vintage Fair the idea is simple - fill a bag with your finds, have said finds weighed and then pay just £15 per kilo. While Kimberley has a bit of experience with a good ol' Kilo Sale, I'd never been before. I was picturing elbows flying and fights breaking out. People can get a little over excited about good vintage. I was ready to be scared. Of course it wasn't like that at all! In fact, it was all incredibly civilised. People standing aside to let you have a look. People clearing space in the changing room so you can fit in. Just a genuinely lovely shopping experience. 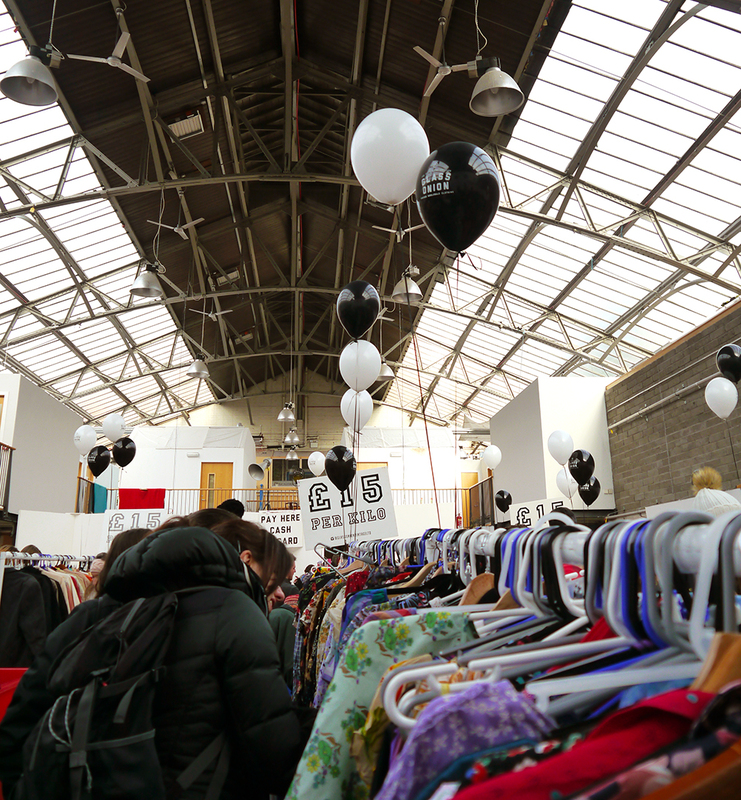 I learned quite a lot during my first Vintage Kilo Sale experience and thought I'd share some tips to make sure your trip can be even better. 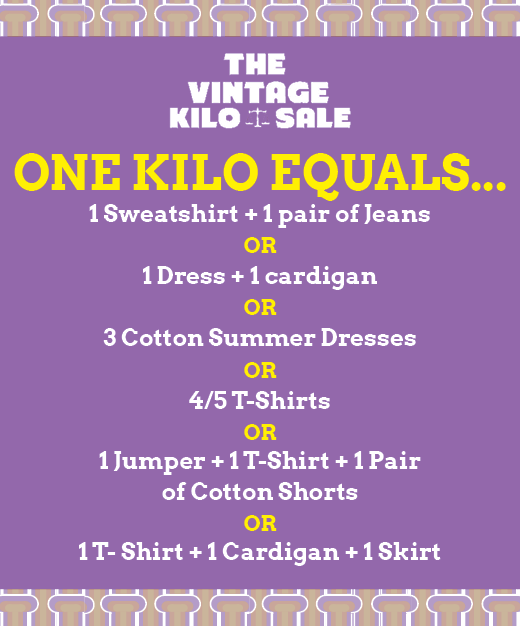 The Vintage Kilo Sale posted this very handy image to give an idea of what constitutes a kilo. Study it, memorise it and have a think about what kind of items you're after. Don't arrive and get overwhelmed by all the rails. 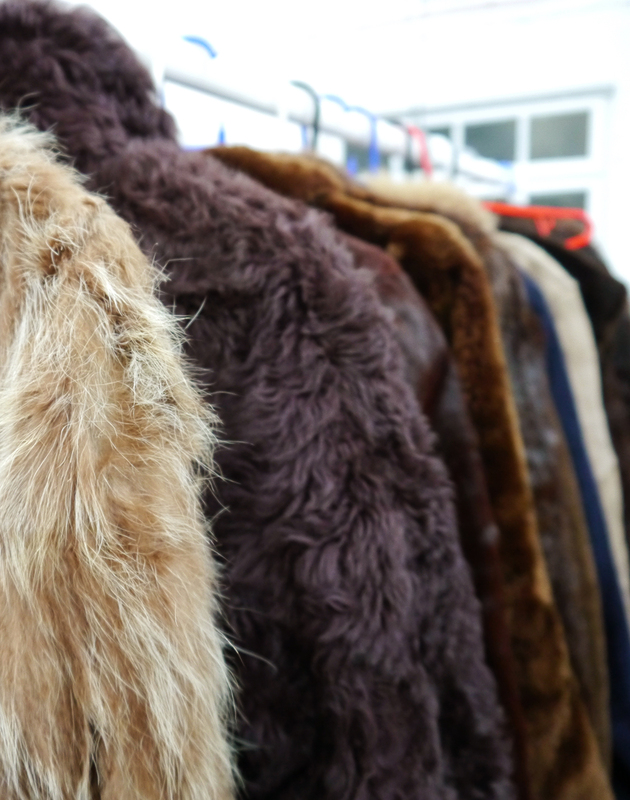 Hone in on what your looking for: be it a new coat, a dress for a special occasion or a super soft velour jumper. Items are arranged by type, so you can head straight for what you want. It costs a little bit more for an early bird ticket but there's a reason for that. 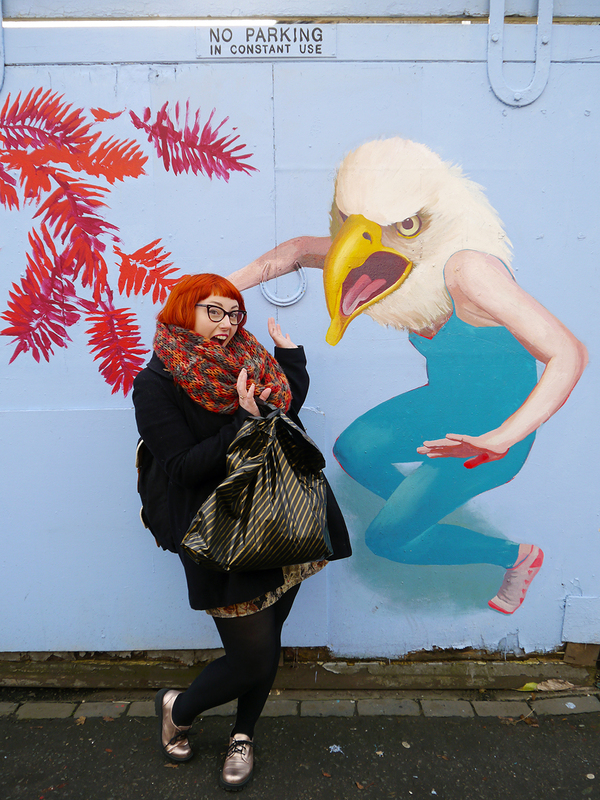 Getting in first means you get first dibs on the best bits. Unfortunately, on the day we hopped on the wrong bus, so ended up being a little bit later than planned. There was still plenty of good stuff but being first trough the door would have meant even more to choose from. 3.) Try before you buy. Figuring out vintage sizes can be difficult at the best of times. When the items aren't labelled, are from different era's and there's a lot to look through, it makes it even trickier. My advice - just forget about it. Use you're eyes to judge fit by the look of the item, add it to your pile and then try them all on. There will probably be a lot of pieces that don't fit right but it's worth it if something you love ends up fitting perfectly. Speaking of trying things on, be aware that the changing situation can be a little less than private, so there's no room to be shy. If you want to remain covered be sure to wear a slip or opt for shorts and a vest top. Whatever is easy to keep on while changing into lots of vintage. Also, don't be embarrassed when it comes to weigh in. If you've picked up too much or you want to go back for some more, just say. The Kilo Sale folk are very helpful and they've seen/ heard it all before. 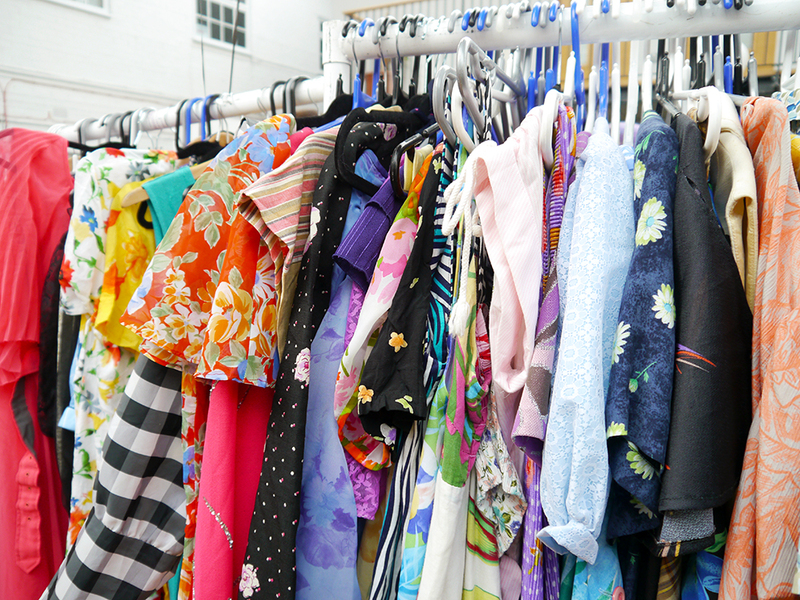 While not as relaxed as a straight forward vintage market, the Kilo Sale does offer a great opportunity to find some real bargains. Our bags were both under a kilo but we were more than happy with what we got. Kimberley went crazy for amazing prints, taking home a fabulous long shirt dress and pretty tea dress. I found myself a dress with a nice floral print and got prepared for chilly weather with a bright green berret and a cosy Christmas jumper. 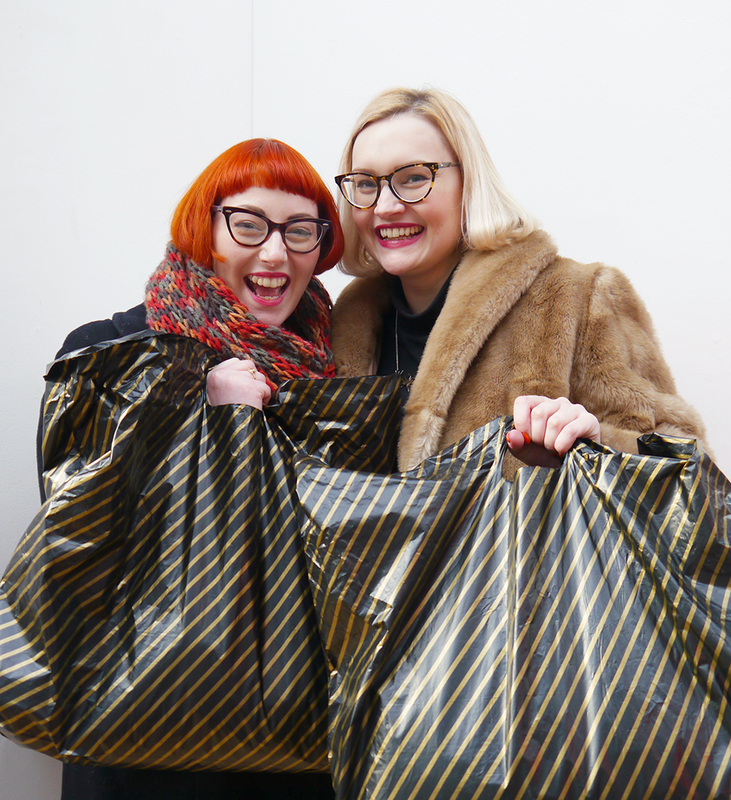 Thanks to The Vintage Kilo Sale for inviting us along and treating us to bags full of goodies.